This limited-production, all-plastic assembly diorama model kit of the Creature from the Black Lagoon is licensed through Universal Studios by Moebius Models. 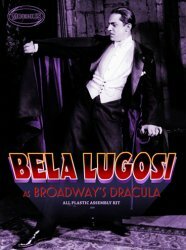 This kit has the victim (Julie Adams in the film). 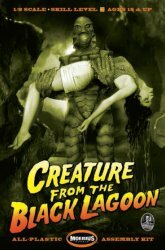 There is only one Creature from the Black Lagoon! Moebius Models" 1/8-scale styrene model features authentic detailing, with over 30 precision-tooled parts. Includes nameplate and complete instructions. Fully assembled kit measures 10.5 inches high, 7.5 inches wide and 6 inches deep. Cement and paint are required for assembly and are not included in kit. This large kit is Skill Level 3, recommended for modelers ages 15 and up. Photo shows sample buildup professionally constructed and painted. Collectors Note: Brand-new, factory sealed thin-walled boxes are tightly shrinkwrapped. Corners of remaining kits are pushed in from shipping but should not have affected kits. Sold as-is. We have reduced the price acccordingly.